Not only will The Legend of Zelda: Breath of the Wild be the first built-from-the-ground-up Zelda game on both the Switch and Wii U, it will be the first in the main series to have both DLC and a Season Pass like expansion pack! Hyrule Warriors, a psuedo-Zelda game, had a season pass released for both the Wii U and 3DS versions of the game containing new characters. Both Hyrule Warriors season passes had a cross-buy function in which you could purchase the Season Pass once and the content would be available on both platforms. It’s unknown at this time if the purchase of the Expansion Pass will follow suit and transfer the purchase between the Wii U and Switch versions. There will be two pieces of DLC, with some additional bonus content unlocked in the full game upon purchase of the Expansion Pass. The first DLC will be released in the summer of 2017, with the second DLC dropping sometime in the fall. 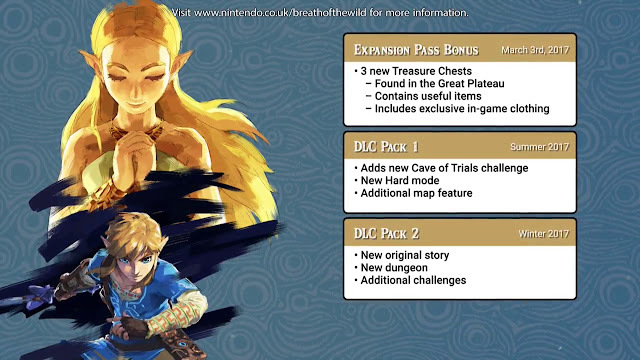 DLC Pack 1 will have a new Cave of Trials challenge, a Hard mode, and an additional map feature, while DLC Pack 2 will have a new story added, a new dungeon, and additional challenges. When you purchase the Expansion Pass you will have access to three new treasure chests in game that contain useful items and exclusive in-game clothing. Nintendo has said that the DLC won’t be available for standalone purchase, it will only be available through the Expansion Pass. The Expansion Pass will be available to purchase on March 3rd, 2017 for $19.99. Many fans have been wondering if Zelda will be a playable character in Breath of the Wild, and I hope the 2nd DLC pack will finally give us that opportunity. The Legend of Zelda: Breath of the Wild launches on March 3rd, 2017 for both the Nintendo Switch and Wii U. Our review will be posted a week later!